Receiving cash to use towards the down payment for your house is a generous gift. Especially considering that some loans require you to pay at least 20 percent of the purchase price as a down payment. But there are certain requirements that must be met when using a cash gift towards your deposit. Here’s what you need to know. Who can give the gift? Lenders tend to be restrictive when it comes to allowing cash gifts to be applied to a down payment. The gift can’t come from just anyone. In most cases, the money must come from a relative – usually a parent, grandparent or sibling. You may also receive a gift from your spouse or the person to whom you are engaged. If you’re applying for an FHA loan, you’ll have a little more leeway. For these loans, your gift can come from an employer, labor union, close friend or even a nonprofit. In order for the gift money to qualify, it must be properly documented. The first step is to write a gift letter. The letter should outline the amount of the gift, the relationship between parties and the property address. It should also state that the money is a gift and not a loan that will need to be repaid. Once the gift letter has been written, you’re not done yet. You can’t simply deposit the money in your bank account and call it a day. You need to create a paper trail to show where the money came from. Write a check for the exact amount of the gift and make photocopies. The check should then be deposited in person into the account that will be used for closing. Make sure to get a receipt for the deposit, and do not deposit any other money at the same time. You may also be required to show additional documentation about where the gift money came from. This can include copies of the donor’s bank statements or even documents from the sale of stocks and funds transfer from a brokerage account to another account. When in doubt, save the paperwork. If possible, try to get the gift money as early as you can. If you can secure the gift money while you’re still in the planning stages, you won’t need as much paperwork down the line as you would with a last-minute gift. Once the check is written and the funds deposited, you’re still not done. Be aware that there may be taxes due for the money that was gifted. The donor generally pays these taxes, although both parties can agree to have the tax paid by the recipient instead. Talk with your accountant about what the current monetary thresholds are for incurring taxes and how your gift may affect your tax liability for the year. 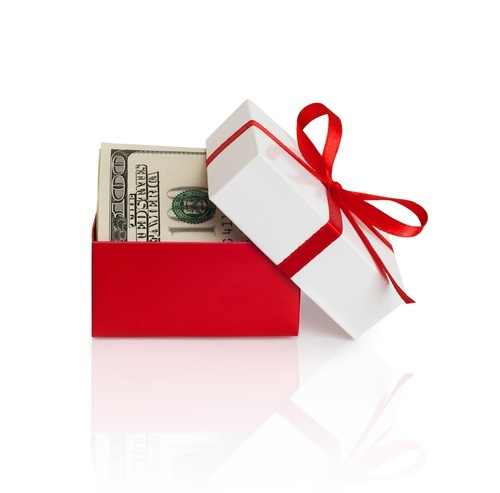 If you’re the recipient of a cash gift for your down payment, congratulations! It’s a great way for loved ones to help with your home purchase, particularly if you’re a first time homebuyer. Follow the steps outlined above to ensure that you’ll have no problems using your cash gift come closing day.